If you a regular follower of my blog, you may feel like I’ve already reviewed The Mending Heart because this is the third mention of the book. But this is the official review. 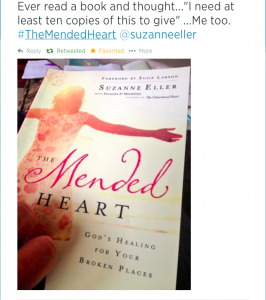 I agreed to review The Mended Heart by Suzanne Eller because of our connection through Bible Gateway Blogger Grid. I thought it would be good experience for me as a blogger and who knows I might enjoy the book. So, I received my copy of the book in the mail and began reading it. When I first picked the book up and read through the first chapter or so, I remember telling Jared about it. “I don’t know if I like this book. I’m not sure I can connect with the content.” Regardless, I kept reading and I’m so glad I did. As I have found is often the case with God, the reason I believe something is placed in my life usually turns into a profoundly different reason that He orchestrated for my good. I mentioned in a previous post that as I read some of the stories in Eller’s book, I didn’t relate. I had thoughts like “I haven’t hurt enough.” “I’m inadequate to minister to others.” However, during the very week I had such thoughts, I began to experience a new kind of hurt. As I began a season of processing through grief and disappointment, God had already orchestrated that The Mended Heart was in my hand. This book is worth your time. This is the first book I’ve read by this Suzanne Eller and as an author, she does something I love. She allows the reader in. I finished this book and felt like if I walked up to her, I would hug her neck and call her “Suz” because I know her. Reading her work made me feel like she knows me. I made a friend through the writing of Suzanne Eller–she just doesn’t know it yet! I can’t wait to go back and pick up one of her other books. You can learn more about Suzanne Eller by clicking here. 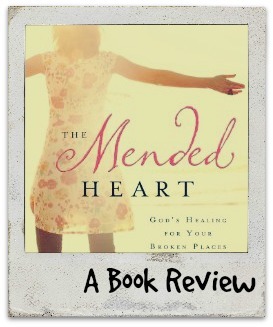 If your heart needs healing (no matter the circumstance), I would encourage you to pick up a copy of The Mended Heart. Question: What is book that God placed in your hand at just the right time? I’d love to hear your stories of God’s provision through Christian writing.